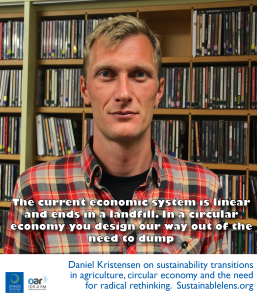 Daniel Kristian Kristensen is a researcher in the Department of Agroecology – Agricultural Systems and Sustainability at Aarhus University. 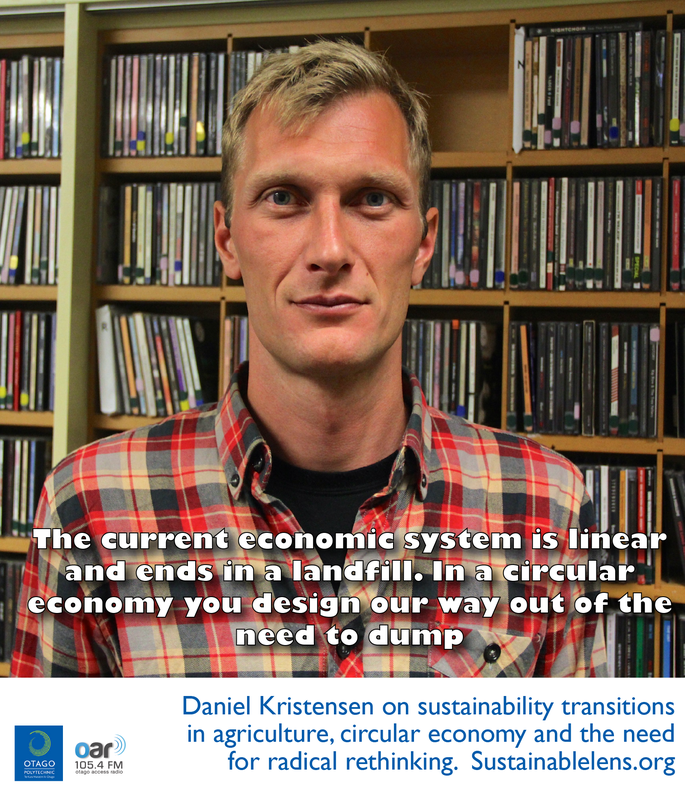 We talk sustainability transitions in agriculture, circular economy, and the need for radical rethinking. It is quite apparent that the system is not suited to continue along the same path as previously…so that’s what I see as a transition, a fundamental shift in the way that agriculture is organised. Agriculture has to deliver…that will be a period of – maybe not conflict – but where the demands on agriculture will be quite intense. We have to drop the idea of there being one solution and embrace the complexity of having to negotiate increasingly globalised solutions for the problems that are occurring locally. There a lot of issues around sustainability, but it’s not one issue so it’s not one solution. Recycling is not enough, it often means you degrade the product. We need to take recycling to a radical extent – upgrade and improve. In a circular economy things have to circulate, not just take a few more loops and still end in the landfill after all. You want to continuously upgrade the product and the services associated with the product – upcycling. (On growth)…the circular economy is a radical reworking of how the economy works on many levels. Growth as we normally think about it might not sit very well with the circular economy, it can be done applying principles to the continuous improvement and new services, but consumption in terms of increasing throughput and throwing more stuff away, that is definitely not compatible with circular economy. It’s a radical transition, but it still approachable for someone that wants to treat it less radically – it’s different actors around a common agenda. I like to think of it as negotiating where we want to go in the future. It is as much as change of mindset as technical solutions. We need exemplars of what is achievable. (Motivation?) Curiosity, how we can go on having an economy and prosperous society? (Activist?) No, would like to be one but I can’t claim to be being very activistic. (Challenges?) Circular economy in a relationship to agriculture. How to get people together, traction on a way forward, getting a framework for long term solutions drawn up – that’s one of the big challenges, there’s of muddling through that is short sighted. The long term vision needs to be there, we need some dialogue on that. We need a conversation about that, creative thinking and involvement in that. (Advice?) Pursue your interests in terms of education and do that as a guide.